The book starts with a preface, set in summer 1881, in which Morton Vance, a member of the Bayswater Bicycle Club, is riding for his life, pursued by another man, also riding a bicycle. It is a race that Vance loses and when the main story begins, in summer 1882, a man has already been tried and executed for Vance’s murder. However, the man who was found guilty of the murder was not the person who had pursued Vance, indeed the official reports reveal that nobody even knows that he was being chased. The man who had been sent to the gallows for the crime was Sam Linnet, an illiterate pig farmer who had a grudge against bicyclists since a collision between a bicycle and farm cart had lamed his son. Frances Doughty is a successful and respected investigator who occasionally undertakes work for the British Government. When Frances meets her contact from the government, she is told that they suspect that members of the Bayswater Bicycle Club may be using their swift and silent mode of transport to carry secret messages and stolen documents to anti-government agents. Frances’ latest mission is to join the club for the social activities deemed appropriate for a lady and keep watch for anything suspicious. She is told that if she meets a man named Gideon she can regard him as an ally. When Frances asks if she will need to learn to ride a bicycle, the government official is dismissive, because a lady would never think of doing anything so unbecoming as attempting to ride a bicycle, nor would their long skirts allow them to do so. Frances infiltrates the club with the aid of her friend, Cyril Garton, a keen bicyclist, but because she is unwilling to be hampered by female attire, she dresses as a young man and passes herself off as Cyril’s cousin. Frances is aware that this is a risky thing to do, as discovery could result in the loss of her reputation and even criminal prosecution for fraud, but she is determined to learn to ride a bicycle. The popular bicycles of the time are the ones that are known today as the penny farthing. At first Frances finds it difficult to ride the high bicycle, but she masters the art and soon finds the exercise very exhilarating. To avoid the continual risk of wearing male garments, Frances purchases an expensive split skirt that looks like an ordinary skirt but allows her far greater freedom of movement and this investment soon proves its worth. Frances discovers that the Bayswater Bicycle Club has many noteworthy members. The patron of the club is Sir Hugo Daffin, an eccentric old gentleman who devotes his life to inventing new adaptions and improvements to the bicycle, most of which are unsuccessful. Surprisingly, he has taken as his assistant Jack Linnet, the son of the man executed for murdering Morton Vance. The investigation comes to a head when Frances attends the bicycle club’s annual summer meeting, accompanied by Cyril, her friend and assistant, Sarah, and a group of friends who have assisted her in previous cases. In a day filled with intrigue and violence, Frances is confronted by several different crimes and has to act swiftly and decisively in order to apprehend the guilty and clear the innocent, as well as renewing her acquaintanceship with the mysterious government agent who calls himself Gideon. Murder at the Bayswater Bicycle Club is the eighth in the series featuring Frances Doughty, but it works well as a standalone novel, with the relevant backstory and series characters skilfully interwoven. It is a time of great change for Frances and those around her and this is explored without slowing the pace of the story. The characterisation is excellent, the main characters are engaging, and the plot is complex but clear. The historical background is impeccable, and it is pleasant to feel that any details of the Victorian period that Linda Stratmann provides are totally reliable. 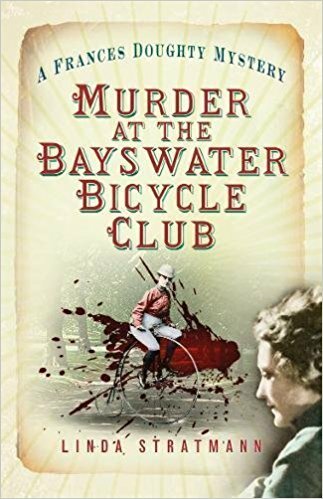 All the Frances Doughty books are fascinating, and Murder at the Bayswater Bicycle Club is a page turner. Recommended. Linda Stratmann was born in Leicester in 1948 and first started scribbling stories and poems at the age of six. She became interested in true crime when watching Edgar Lustgarten on TV in the 1950s. 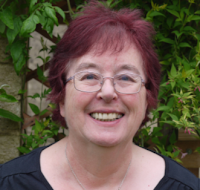 Linda attended Wyggeston Girls Grammar School, trained to be a chemist’s dispenser, and later studied at Newcastle University where she obtained a first in Psychology. She then spent 27 years in the civil service before leaving to devote her time to writing. Linda loves spending time in libraries and archives and really enjoys giving talks on her subject. 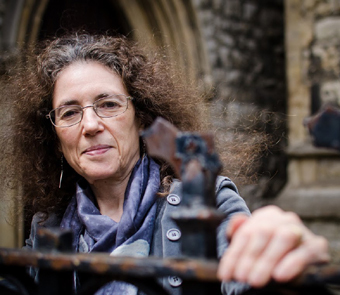 Her crime novels are set both in contemporary and Victorian times. The Terminal Velocity of Cats the first in her Scene of Crimes novels, was published July 2013. Carol recently gave an interview to Mystery People. To read the interview click on the link below.